Hi guys. Throwing it back old school with a PS2 Tutorial. Please watch the video below for instructions, otherwise please read below, there will be a written tutorial for more advanced modders who do not need videos. Okay, Firstly you will need to disassemble your ps2. then move to the front where the memory card slot is, and finally move down to the thin end. Please see image below of sensor locations. 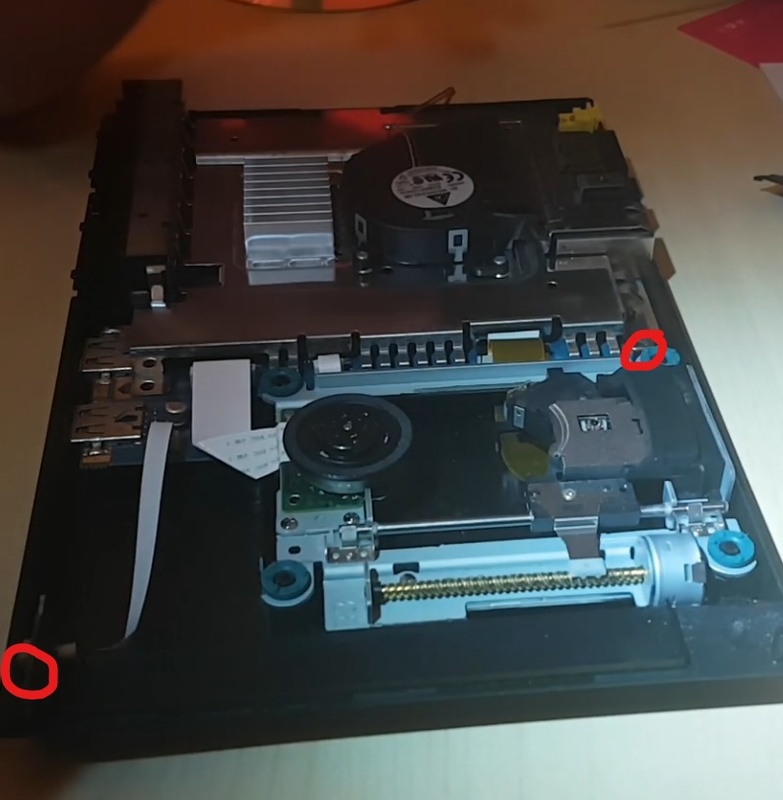 one is on the power button board and the other is next to the back of the disc drive caddy to the left of it on the main board. You can use either Tape or Bluetack to keep the sensors down, it is recommended you use Bluetack as i found it stuck better and did not come off at all. Now you have set your PS2 up for the swap trick. Congratulations!!!! Take note of the disc. It is recommended that you use a DVD as the swap disc. this can be seen on the front. it will say "DVD" or "Compact Disc"
You will need to click on the drop down menu and select your DVD drive. Wait until ISO is successfully created. Copy and paste this file anywhere as we only need it for just a moment. Now, my one says "SLES_536.36", but your one will most likely be different. take note of the file name. Now you must Right Click on the cogswap file we just renamed and press "PROPERTIES" to view file information. Click on menu option "ISO Tools" and then click "change TOC for selected file"
You must modify the size value to the one of cogswap shown in properties. it is show as a byte value. Now chose a method of your own to burn this ISO to a DVD, i just used the burn option in Apache3Preview. Now we have uLaunchELF_v4.12 Disc!!!! You must format this USB to FAT. Congratulations, that was the hardest part!!! Tadaaaaa, you now have the FreeMC Boot installer open. Congratulations you have now successfully installed FMCB without having to pay a cent for any games or swap discs like 007. You can now remove any bluetack, sensor jamers you used and reverse disassembly to reassemble. Nice tutorial. Anyway I can't understand one thing. Why we can't use "FREE_MCBOOT.ELF" in place of cogswap at start? Have you tested this by any chance? I believe that we cannot put FREE_MCBOOT.ELF in there because it needs other files which are stored in the installation folder. As a result, if we tried putting them on the disc it may change the size of the disc and the location in which the files are stored, therefore causing an issue when swapping. this way keeps everything where it should be as we are only modifying an existing file. For example, if the laser is expecting to find the launch elf in a certain spot, and we add more files to the disc, we could potentially change the location of the file it is seeking, which will then not allow for the ps2 to boot into it. Sorry I don't have PS2 with working drive. Not sure that FMCB installer need all those files to install. But your point make sense as installer elf itself just install FMCB if not find other files like OPL or ESR. So we land in point where we have FMCB but can't use it. So you're right here. perhaps if we could boot ulaunch.elf from the disk it may work, unfortunately with my testing i could not get ulaunch.elf to boot without using cogswap. Do you have any idea why virustotal is detecting your package as a virus. I'm sorry I asked but I wanted to make sure it is safe before downloading. EDIT: May this be caused by Apache? No idea why it is detecting a virus. Lots of antivirus have false positives when they have never seen a file before. There might be something in there that one of the antivirus has never seen, it could also be the nature of how the tools work. Apache both connect to internet to download updates, maybe a virus software does not like this. If you do not trust it i would recommend completing the process in a virtual machine. I have tested all on my machine without any issues. It sounds like you might be trying to boot a version which does not work or it has not been burned correctly. which version of ulaunch did you download from the archives? Ok, did you use the DVD version for your DVD? and can you please take a picture of your screen on cogswap and upload to imgur and send the link here? just so i can see what is happening. Yeah, I used the DVD version . The first pic is the result after putting the Ulaunch in the laser. Maybe try this with a CD? i can confirm the CD version works but seems people may be having issues with the DVD version. Let me know! One question, I've heard you need a specific set of games for install FMCB, rather than just any DVD-based PS2 game... is this true?